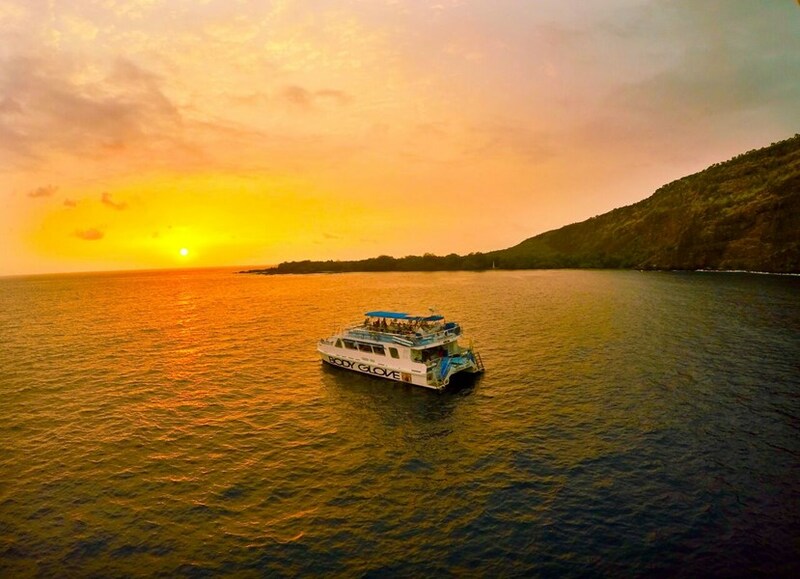 Step aboard and journey back in time, when ancient, powerful Kings ruled the rugged and fertile land of the Hawaiian Islands. 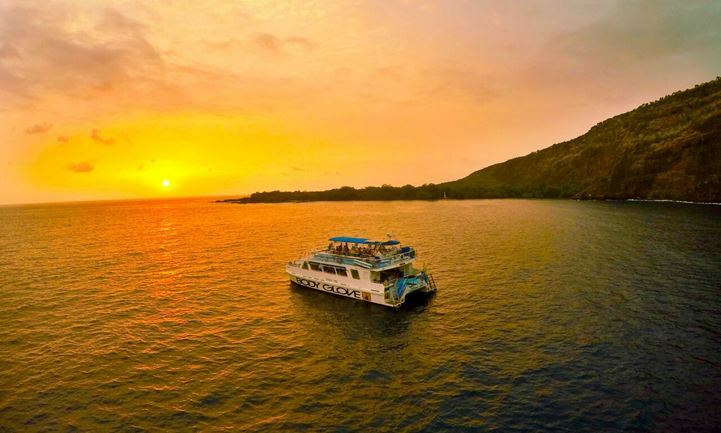 Our luxurious, three hour guided historical dinner cruise to Kealakekua Bay and Captain Cook’s monument will capture your imagination and reveal many secrets of the Big Island. 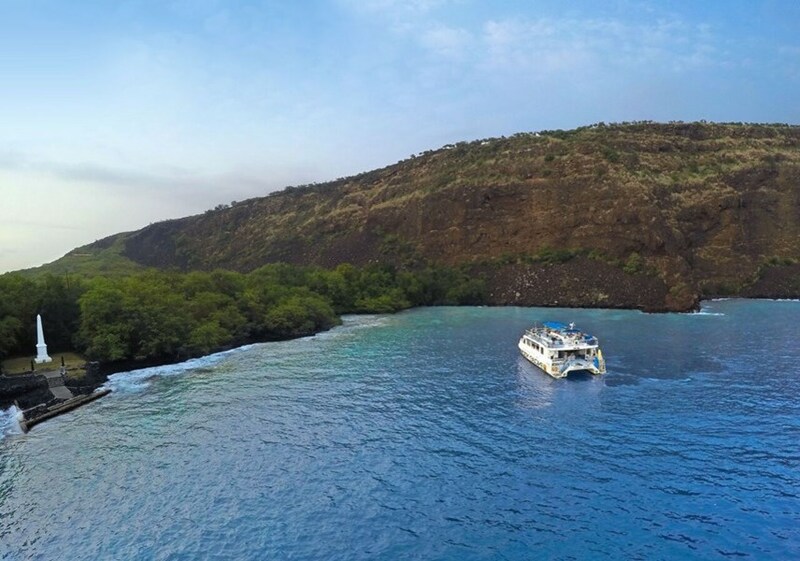 Cruise 12 miles down the Kona Coast to Captain Cook’s monument while a local historian points out over 50 points of interest and historical sites. 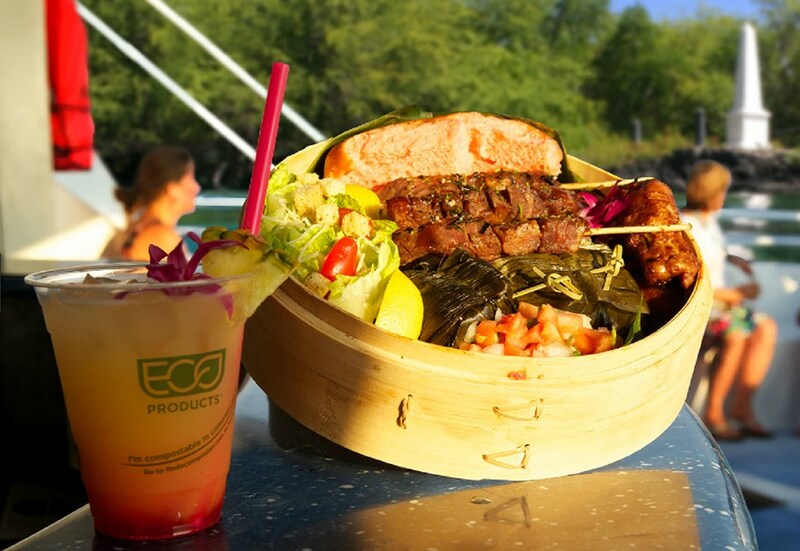 Upon arriving in Kealakekua Bay a Hawaiian style buffet dinner is served. 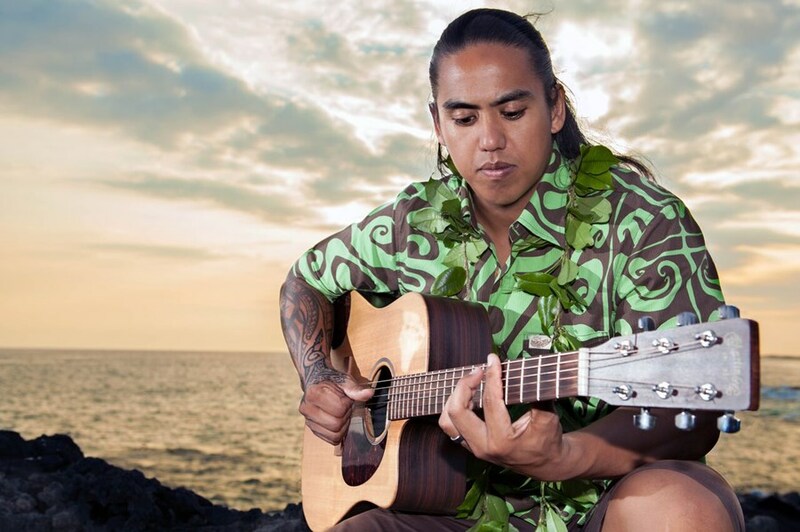 Listen to live entertainment and watch the beautiful sunset on the way back. Includes one complimentary cocktail and cash bar thereafter. All of our meals are prepared by Chef Jason Lofland, author of ‘Catch!’ The Discovery Channel’s Deadlist Catch’ Official Cookbook. This adventure wheelchair friendly, our customized boarding ramp, with portable extensions accommodates all wheelchairs including manual, electric and scooters. The lower deck of the 65’ catamaran is fully accessible from bow to stern including tables and restrooms. For those on our Snorkel Adventure an array of flotation devices are provided. All captains and crew are Lifeguard, First Aid and CPR Certified. Dinner Cruise Tu, Th, F, Sa, Su 3:30 PM 3 hours Directions can be seen in the booking page & will be included in your confirmation email. See map below for approximate location. At this time we do not do pickups. 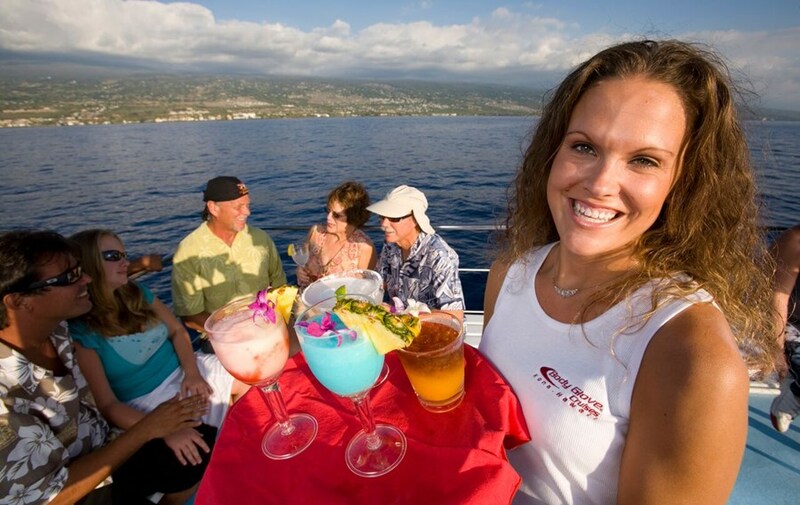 Our check in location is The Kailua Pier is located in the heart of downtown Kailua Kona, oceanfront of the King Kamehameha Courtyard Marriott Kona Beach Hotel. When you make a reservation, please pick where you are staying so you can get directions in your confirmation email. Yes, there is free parking at our office, which is one block away from the pier. Do you have gluten free, vegetarian, or vegan meal options? Yes! When you make a booking you will get our phone number, please call us 48 hours in advance to request gluten free, vegan, or vegetarian meals. We took the dinner cruise and it was totally worth it the staff was extremely friendly and the historian was full of information. The food they served was top notch as well. Even got to experience some dolphins swimming along side the boat. These people know how to spoil customers and EVERY business on the island should take a lesson from them...We did the Captain Cook Sunset Diner Cruise Christmas Eve. 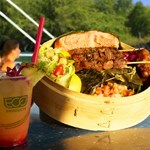 They were on time, the service was phenomenal and the food was even restaurant quality and abundant. The live music was enjoyable and the historian was extremely knowledgeable and interesting. 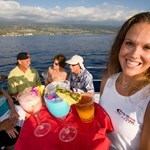 Don't have sea legs - they will happily get ... moreyou food, beverages - they are amazing. Most of the seating is under cover, so I assume it would be a good rainy day attraction. A hat with a strap is a good idea, and you might consider a light sweater in the evening during winter. It is by far the best money we spent on this vacation. I HIGHLY recommend it. 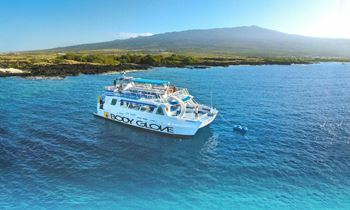 The Body Glove dinner cruise is fantastic. The food, crew, music and narrator were all wonderful. 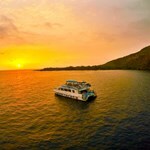 During our three our tour not only did we have a very nice dinner and beautiful music, we saw whales and dolphins all topped off by the beautiful site of Captain Cook monument and a gorgeous sunset. This is one thing we will do again next year.You won't be disappointed if you do this tour. Everyone on ... moreboard had a great evening. 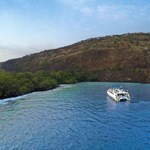 Booked this cruise while visiting Kona. It was our 30th wedding anniversary. The service was outstanding and the scenery was really great. We had a historian on the boat telling us about Hawaiian sacred sites and some history of the island. 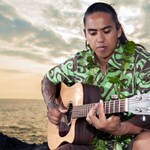 There was a great Hawaiian musician playing Hawaiian songs. 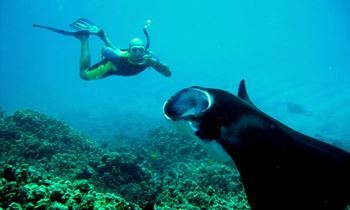 We stopped near the Captain Cook memorial for dinner and there was a large manta ray swimming around ... morethe boat. Great food and plenty of it is the best way to describe the dinner. 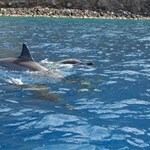 On the way back to Kona we had a few dolphins racing the boat back to the port. A truly memorable afternoon and evening. 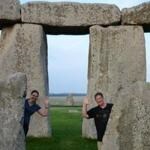 Highly recommend this dinner tour. Did the dinner cruise and brought my elderly mother along. We all had such a great time ! The music was live (not at all cheesy as one reviewer described) mellow voice that fit with dinner.I was pleasantly surprised with the meal that was provided (Kalua pork, lomi lomi, huli chicken, salad, cheese cake...). Full bar on board and bartenders kept everyone's cup full. The history narrator was funny ... more, knowledgeable and mingled with the patrons after her part was done(she like all the staff really enjoyed spending some time with all of us). THANK YOU ALL ! The first time we tried to see the Captain Cook monument it was like a scene out of Gilligan's Island! A 3 hour tour! !it became so rainy and windy Captain bob had to turn around. But they still fed us dinner!!! They gave us a card when we debarked so we could call and re-schedule without charging us anything additional. They even fed us dinner again!!! Friendliest crew on any boat or attraction I've ... moreever seen!!! 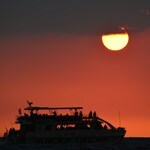 We did the Historical Dinner Cruise and Whale Watching cruise on different days. Bring a hat with a strap so it won't blow off and sunscreen. Some beverages and snacks are free and the alcoholic beverages are available for purchase. We didn't see any whales but did see Dolphins and Manta Rays and still had a good time just riding on the boat. The Historical Dinner Cruise was great! Informative, beautiful ... moreand the food was good. We took a snorkeling cruise with a different operator and I wish we had booked on this boat. The staff is very accommodating and friendly. One of our party has difficulty walking very far. There are booths downstairs and more seating upstairs. The staff helped her step off the ramp onto the boat and she was able to sit comfortably for the whole cruise. There are also restrooms onboard. Give yourself extra time to park. We were dropped off at the pier and the car driver drove back to the Body Glove office and parked in their lot for free. There is also parking available near the pier for a fee. 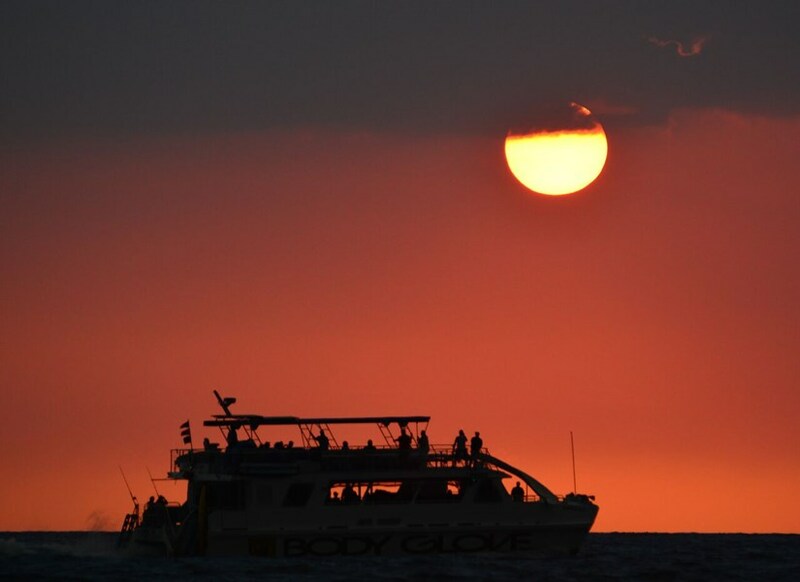 Both times I was on board, the people were very friendly, the pupus are outrageously delicious and well prepared, and the wet bar just made the sunset all the more beautiful! We had a beautiful evening on the boat with dinner and entertainment. We also saw a Manta Ray as we cruised to our dinner site, and the crew caught a Mahi Mahi on the way back. It was a great evening.